Memorial Day weekend is now behind us – an important pause to remember and reflect on those who gave their lives for the freedoms and rights that we all enjoy. It also means the “summer” season has begun. The fishing rodeo season is in full swing. For those not initiated, these are free youth fishing events held around the state by civic organizations and partners for the enjoyment of children and families. The sites are usually well stocked with fish and it is great fun with a little bit of a competitive edge tossed in for the kids, with prizes and trophies. Gather up your kids – or perhaps a group of neighborhood kids – and head out to one of these fun events near you. 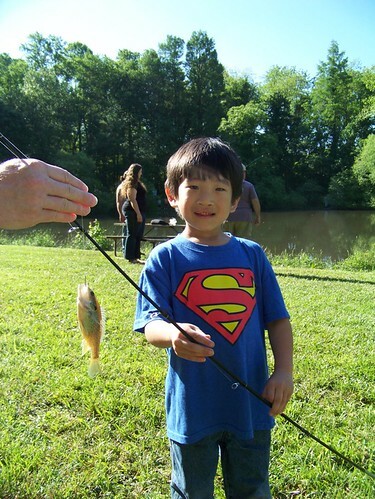 Don’t forget there are some free fishing days coming up June 2, June 9 and July 4. If you can think of someone you might like to introduce to fishing, this is a great opportunity for someone to try the sport without buying a license. Anglers will continue to experience wet conditions for most of the upcoming week. Bay temperatures are hovering near the 70 degree mark and will slowly rise this week due to warm air temperatures and longer daylight hours. The recent algal bloom known as a “mahogany tide” on the middle part of the western shore continues to cause some reduced water clarity and poor oxygen conditions below depths of 15 to 20 feet. However, other portions of the main bay and tidal rivers have much better oxygen conditions. There will be above average tidal currents Friday through Tuesday as a result of the full moon May 29. For the full weekly fishing conditions summary and more detailed and up-to-date fishing conditions in your area of the bay, be sure to check out Click Before You Cast. Also check out the new Bay Bottom Habitat Mapper that shows bottom type, fishing reefs, popular fishing areas, recent oyster planting sites and submerged aquatic vegetation. The depth/navigation charts backdrop allows you to see their relationship with nearby channel edges, points, humps, flats or other key contour features. It is no secret that the upper bay has been receiving a lot of runoff from the Susquehanna River and western shore rivers like the Patapsco. Generally speaking, the Susquehanna Flats area has water clarity issues making for poor fishing, and the western side of the bay is also showing stained water. The eastern side of the bay is a bit clearer and the trolling action tends to be better. The Triple Buoys and the Love Point channel edges have been poplar locations to troll a mixed spread of medium-sized bucktails, spoons and umbrella rigs. Chumming has been more popular in the stained waters on the western side of the bay at some of the 7 and 9-foot knolls, Belvidere Shoals and Podickory Point. At Podickory, the 25-foot channel edges are a sweet spot on a flood tide. Allowing baits to sink to the back of the chum slick and rest on the bottom tends to catch the largest fish. There is plenty of striped bass action in the vicinity of the Bay Bridge this week. Jigging around the bridge piers and rock piles to suspended fish has been good, while soft plastics and bucktails have been popular baits. The sewer pipe just north of the bridge on the eastern side has been a popular place to troll or set up a chum slick. Water temperatures in the middle bay are hovering around 70 degrees and the fishing for striped bass is about as good as it gets. Trolling, jigging and chumming are all excellent ways to catch striped bass. Trolling has been good along the major shipping channel edges from the Bay Bridge south past Bloody Point, Buoy 83 to the CP Buoy. Most are trolling a mix of medium-sized bucktails dressed with sassy shads in chartreuse and darker colors in tandem or behind umbrella rigs. Spoons can also be effective and some anglers are mixing in a few large parachutes in their trolling spreads, in the hope of intercepting a large striped bass. The western side of the shipping channel – from Thomas Point south past Chesapeake Beach to Calvert Cliffs – has also been a popular place to troll. Jigging has been a very popular way to catch striped bass along the same channel edges others are trolling. Many are using relatively light jig heads with skirted soft plastics in 6 to 8-inch lengths. There is a wide opinion on colors, and pink and purple often come up in the conversation. Chumming and chunking has been a successful way to get striped bass to come to you. Perhaps one of the most popular places to set up is the 35-foot outside edge of Hacketts Bar. Allowing baits to sink to the bottom at the back of the chum slick tends to account for the largest striped bass. The outside edge of the Hill has been a good place to chum and there have also been good reports coming from the Diamonds. The shallow water fishery for striped bass continues to provide fun light tackle topwater action in numerous areas of the bay and tidal rivers. The rocks at Poplar Island have been great to cast poppers in the early morning and late evening hours. As the mornings wear on, many are finding casting swimshads is another great way to catch fish. There are too many places to count along bay shores and tidal rivers where shallow water striped bass can be found feeding. Most of these fish tend to be in the 18 to 19-inch range, but they offer a lot of fun on light tackle. There is a lot of fishing action going on in the lower bay, and as one would imagine striped bass are at the top of the list. Trolling down the eastern side of the shipping channel from the CP Buoy down past Buoy 68 has been good, and also from Chesapeake Beach south past Parkers Creek, Cove Point to Point Lookout on the western side of the shipping channel. The 35-foot edge tends to be the best depth to find suspended striped bass. Parachutes, medium-sized bucktails dressed with sassy shads and spoons have been popular items to troll. Most of the striped bass being caught are under 30 inches but offer the best grade of striped bass. The channel edge along St. Georges Island and Piney Point have also been good places to troll. Jigging with bucktails and soft plastic jigs to suspended fish along the same channel edges and the lower Patuxent River has been very good. 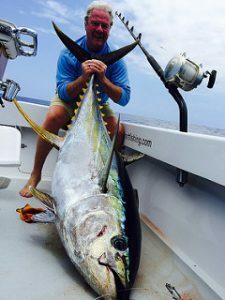 Casting to the shallower areas along the eastern side of the bay in Tangier Sound has been offering some excellent fishing for those casting topwater lures and swimshads. The marsh edges, stump fields and points have been holding a lot of striped bass that are just above and below the new 19-inch minimum. Speckled trout and slot-size red drum are a welcomed part of the mix. The cuts through Hoopers Island are also a very popular place to cast bucktails, soft plastic jigs and swimshads. On the western shore the areas around the mouth of the Patuxent River has been a great place to cast topwater lures and swimshads to shallow water structure. 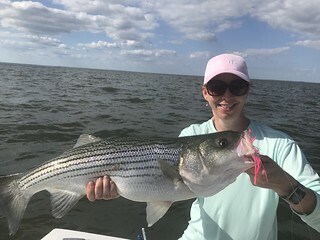 Chumming is a popular way to catch striped bass in the lower bay this week at traditional locations near Buoy 72, Cove Point, Point Lookout, and in the lower Potomac River near St. Georges Island and Tall Timbers. The first appreciable numbers of croakers are showing up in the lower bay region this week. Areas around Point Lookout, Tangier Sound and the lower Potomac near Bushwood provided some action this past weekend. The croakers tend to be on the small size and are mixed in with white perch. White perch have moved into their typical summer holding areas and are offering good fishing in all regions of the bay. The lower end of the tidal rivers and creeks are great places to look for white perch around docks, piers and similar structure. Grass shrimp and bloodworms are good baits to use on simple bottom rigs, and beetle spins or spinners can be cast along shallower structure in the mornings and evenings. Recreational crabbing has of course been disappointing so far this season but small blue crabs are molting, so we’ll just have to be patient. The eastern side of the lower bay offers the best chance to catch some crabs if anglers have the time. Look for them in the lower sections of the tidal rivers and creeks due to the influx of freshwater from storm runoff. Heavy runoff from recent storms has caused many rivers in the central, western and southern regions to be stained and running at flood stage. The middle and lower sections of the rivers tend to be taking the most abuse, while creeks and streams in the upper parts of the watersheds tend to fare better. The upper Potomac in Washington County is at flood stage, as is the Patapsco; both are unsafe to fish. Deep Creek Lake seems to be in fine shape and fishing for a mix of walleye and smallmouth bass, and yellow perch continues to be good for those drifting live minnows. Trout fishing is fine in many of the smaller streams in the western region and the upper Potomac River in Garrett County, although flows are brisk. The upper Potomac River from Westernport to above Barnum received a stocking of 2,500 trout Tuesday. Those fishing for largemouth bass are beginning to notice a shift toward a summer mode of behavior in some of the warmer waters such as ponds and shallow lakes. The bass are still feeding aggressively through late morning, but on sunny days they often move to deep cover in some kind of shade during the middle of the day. The overcast weather we’ve been experiencing tends to extend their hours of movement and feeding. Spinnerbaits and crankbaits are good lures to use in the transition areas between shallow and deeper waters. Topwater lures and lipless crankbaits are good choices in the shallower areas. Grass beds are filling in or have completed their growth so grass is a common target to look for bass. Stick worms and topwater lures are proven lures to use. Northern snakeheads will also be found in these grassy areas and they are getting ready to spawn if they have done so already. The tidal Potomac will be running a bit stained and high this week, but fishing for blue catfish should be good – it is possible that the catfish may respond to the turbulent water conditions in a positive manner. There certainly are plenty of medium-sized blue catfish in the tidal Potomac and Patuxent rivers. Fishing for channel catfish continues to be good in the tidal rivers flowing into Chesapeake Bay. The Ocean City and Assateague Island beaches have been providing some good opportunities for bluefish, on cork float bottom rigs baited with cut mullet. Striped bass are also being caught on cut bait and numbers are improving. Medium-sized black drum are taking clam and sand flea baits, while kingfish are taking bloodworms. Bluefish have also been moving in and out of the inlet with regularity; casting various lures or drifting cut bait has been the way to catch them. Flounder are being caught in the inlet area and water clarity is improving in the back bays. Sinepuxent Bay has been a standout for flounder fishing lately for those using squid/minnow combination rigs or large scented soft plastic baits on jigs. Around the Route 50 and Route 90 bridges, there continues to be catch-and-release fishing for striped bass smaller than 28 inches on swimshads. 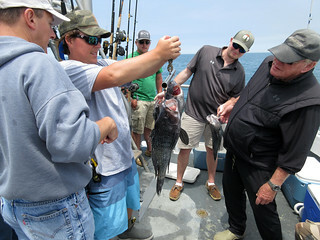 Offshore, sea bass fishing has been fair to good on some of the wreck sites. 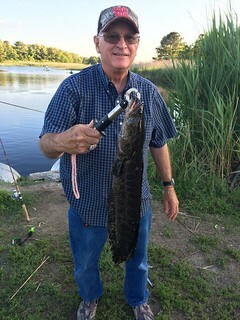 It pays to move if fishing is slow. Farther offshore a few mako sharks and false albacore have been found on the 30 Fathom Line sites. Out at the canyons, some respectable Bluefin tuna, yellowfin tuna and bigeye tuna were brought into the docks from the Poorman’s Canyon this past weekend.